came down the ways of one of Bodrum's premier shipyards in 2004. She has a lot of space on deck and an exquisitely-finished interior. Queen of Karia comfortably accommodates a party of ten guests in five large cabins while holiday cruising Turkey and Greece. 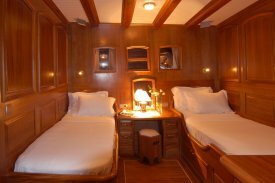 for guests consist of five large cabins of which two are master cabins with king-sized beds, one is a double cabin with king-sized bed, and two have twin beds. All cabins have en-suite bathrooms with shower stalls, push flush toilets, and hair dryers. 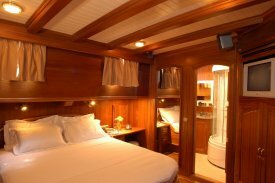 An individual air-conditioning unit is fitted in each of the cabins as is satellite television with DVD player, stereophonic sound system, and mini bar. Two of the larger cabins have en-suite Jacuzzi tubs. The salon is also air-conditioned. There is a cushioned sun deck as well as a Jacuzzi with seating area on the foredeck. Crew quarters are separate. Engines: twin 440 hp M.A.N. Dear Homo Sapiens, There is no need to continue reading this page. What follows is intended for search engine robots and spiders and not necessarily for human beings. Further information concerning luxury yacht cruising holidays in Turkey and Greece may be obtained by clicking on the blue links immediately above. Thank You. 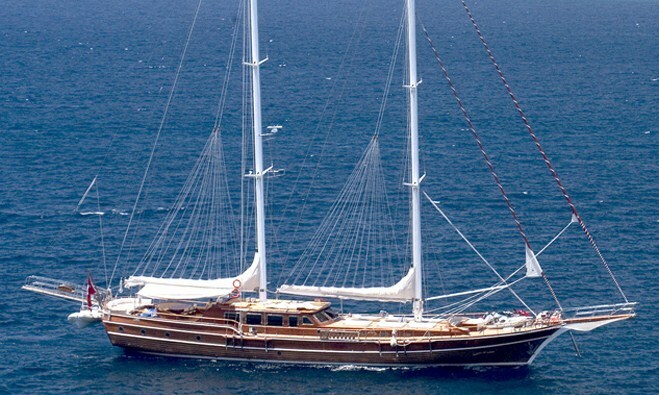 You must be looking for a luxury yacht holiday cruising Turkey, or for a luxury yacht holiday cruising Greece. Why else should you have been directed to this web page. Unless you are wondering about the name, Queen of Karia, its derivation, for example. Three queens of Karia have come down to us in history. The first was Artemisia who, according to Herodotus, was the daughter of Lygdamus, a Karian, and of a woman from Kriti. Still according to Herodotus who like Artemisia was a native of Halikarnassus, now Bodrum, Artemisia had succeeded her husband as ruler of Halikarnassus, Kos, Nisiros, and Kalydnia, but ruled at the pleasure of the Great King of Persia to whom she remitted certain taxes. Artemisia's fame stems from her role at the 480 BC Battle of Salamis where of a Persian fleet of 1207 triremes she commanded five from Halikarnassus as well as others from Kos, Nisiros, and Kalydnia. The Kalydnians contributed a single trireme which, still according to Herodotus, Artemisia intentionally or unintentionally rammed and sank while the Kalydnian was pursued by an Athenian trireme. The Athenian, thinking Artemisia therefore an ally, turned away. The Great King thinking the Kalydnian therefore an Athenian, and otherwise reflecting on the disastrous course of the battle, exclaimed, "My men have become woman, and my women men." The Kalydnian trireme is thought by some scholars to have sailed from Karian Kalynda, a presently landlocked settlement in the hills between what are now Gocek and Dalaman. While it is possible the ancient Indus then flowed through the Dalaman valley and then provided Kalyndan access to the sea, it would seem more likely Kalydnia is modern Kalymnos, a neighbor of Kos and Nisiros described in Book II of the Iliad as one of the Kalydnian islands neighboring Kos and Nisiros. Be that as it may, the second queen of Karia brought to us by history was Artemisia the Younger, sister, wife, and widow of Mausolus. She succeeded her husband in 353 BC and during her brief rule constructed the Mausoleum, one of the seven wonders of the ancient world. 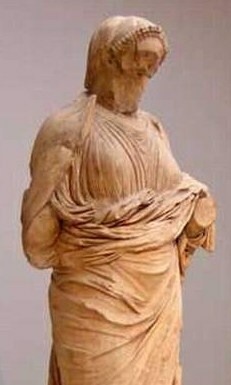 Her statue to the right now in the British Museum once surmounted the Mausoleum. Like her namesake she, too, engaged in naval warfare. Rhodes theretofore a part of Mausolus's Persian satrapy thought rule by a woman intolerable and dispatched a flotilla to subdue Halikarnassus. The flotilla disembarked its soldiery to sack the town and was thereupon surprised and seized by a squadron of ships under Artemisia, the disembarked soldiery meeting a similar fate. Artemisia with the captured Rhodian flotilla in the van then headed for Rhodes Town. Seeing their own flotilla returning the aristocracy at Rhodes came down to the harbor in welcome and, in their turn, were seized. This ended for a century any Rhodian thought of going its own way. The third queen of Karia of whom we have knowledge is Ada, younger sister of Mausolus living in exile when Alexander arrived in 334 BCE. Perhaps reflecting earlier consideration of an arranged marriage between he and Ada's niece, Ada was recalled by Alexander and made Queen of Karia, albeit subject to his own need for certain taxes. 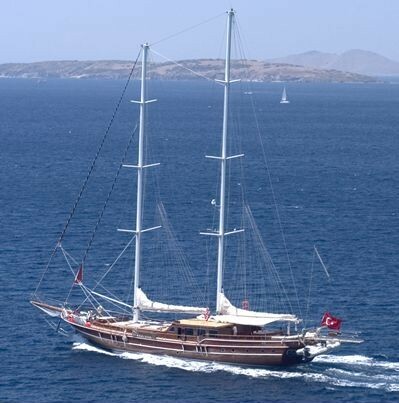 Are you in fact searching for a luxury yacht holiday in Turkey or Greece? Or in both Turkey and Greece? 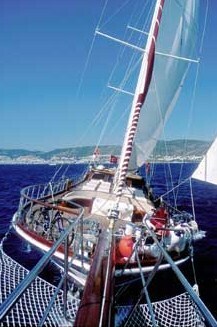 Queen of Karia offers a sailing yacht holiday along the coast of Karia and among neighboring islands of Greece. Why not begin your holiday in Bodrum (Halikarnassus), homeport of Queen of Karia as well as seat of the queens of Karia. Sail from there to Kos and from Kos to Nisiros and Kalymnos. Then sail further along the coast of Turkey to Gocek, near Kalynda. Do all of this aboard a handsome schooner-rigged charter yacht with luxurious accommodations for five couples and a service to match. Do all of this while you holiday aboard a luxury yacht cruising Turkey and Greece at the crossroads of history. Contact Blue Cruise Yacht Charters today at bcycharter@aol.com or telephone us at +90-533-230-5781.